Was it wise for the Swiss National Bank (SNB) to abandon the exchange rate floor vis-a-vis the Euro (EUR) half a year ago (see the blog entry on the decision and on the critique by Willem Buiter)? Is the Swiss France (CHF) overvalued? 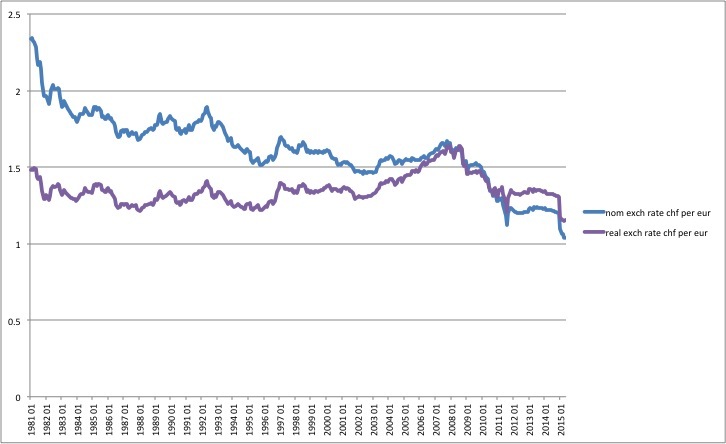 The following graph plots the nominal and real exchange rates since 1981 (the real rate is computed based on Swiss and Euro area producer price indices, 2010=100; data file). Relative to the long-term average, the CHF currently is overvalued in real terms by 14%. In December 2014, it was overvalued by 4%; and in August 2011, by 11%. But in December 2007, it was undervalued by 21%. According to the real exchange rate metric, importers (households) thus suffered more in 2007 than exporters suffer today. For a related assessment based on consumer (Big Mac) prices, see this blog post. The real exchange rate is just one metric to assess whether a currency is overvalued. There are many others, see for example this IMF paper or this book. Also, foreign exchange market participants are willing to buy and hold CHFs and EURs at the going market rate; they seem to think that the price is right. If the price were right and policy weakened the CHF, then Switzerland would trade off “competitiveness” of the export sector on the one hand, and expected capital losses on the country’s EUR holdings that would have to be purchased to temporarily strengthen the EUR on the other. Back-of-the-envelope calculations by my colleague Harris Dellas suggest that weakening the CHF would not be worth it, financially speaking. Even if, for whatever reason, society favored a weaker CHF it is not clear that the SNB should intervene. The SNB should only act if its mandate of pursuing price stability calls for such action. In the short run, a weaker CHF would indeed help to push the inflation rate in the desired range. In the longer run, however, a further lengthening of the SNB’s balance sheet (resulting from forex market interventions) could undermine the SNB’s flexibility, in particular if political constraints were to bind. This does not rule out, however, that other institutions in Switzerland could or should enter the exchange rate business. In principle, fiscal policy makers could institute a sovereign wealth fund that is financed by issuing CHF bonds and invested in EUR assets. Fiscal policy makers could also try to redistribute from those currently benefiting to those suffering from the CHF/EUR exchange rate. Export subsidies could be an instrument. They would be hard to implement though if one wanted to account for intermediate inputs. That Switzerland has an independent currency is a choice that reflects repeated, in depth deliberations. Advantages of pursuing an independent monetary policy include the option value to pursue price stability even if other currency blocs don’t; and the ensuing credibility benefits for Switzerland as a whole. Disadvantages include temporary, but potentially long-lasting real exchange rate misalignments that strain some groups (e.g., workers in the export sector) while benefiting others (e.g., consumers). These advantages and disadvantages do not come as a surprise; Switzerland has chosen them. 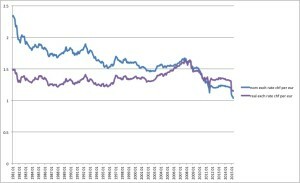 This entry was posted in Contributions and tagged *, Capital loss, Competitiveness, Euro, Exchange rate, Exchange rate floor, Real exchange rate, Sovereign wealth fund, Swiss Franc, Swiss National Bank on July 14, 2015 by Dirk Niepelt. Contrary to assertions, the Greek population has also benefited from the rescue credit. Calculated from the onset of the crisis, in net terms one-third of the public credit has contributed to financing the Greek current account deficit, one-third to paying off private foreign debt, and one-third to capital flight by Greek people. Furthermore, the country has profited greatly from the lowering of interest rates on its foreign debt, an advantage that translated into around 50 billion euros between 2008 and 2014. In 2014, overall Greek private and public consumption amounted to almost 114% of net national income. Greek banks have received some 80 billion euros in ELA credit from the Greek central bank in the past few months. ELA credit, which can be blocked only by a two-thirds majority in the ECB Council, exceeds by far the recoverable assets of the Greek central bank in case commercial banks go bankrupt and the collateral pledged by the banks loses its value. Thanks to ELA, the private capital fleeing to other countries has been replenished with public credit from the international community. This credit has strengthened Greece’s negotiating position with the international community by increasing the other euro countries’ potential losses in the case of Grexit. This could explain why the Greek government has played for time in the current negotiations. If it should come to a Grexit, it would be crucial to introduce as quickly as possible a new legal tender, in order for all price tags, as well as rent, credit and wage contracts to be redenominated and devalued simultaneously, restoring the competitiveness of the Greek economy. A creeping transition to a new currency by way of state-backed promissory notes (IOUs) that are not legal tender could buttress the solvency of the Greek government, but it would not solve the competitiveness problem. Econometric studies have shown that an economic upturn can make itself felt in as little as one or two years after a devaluation and a haircut on outstanding foreign debt have been carried out. 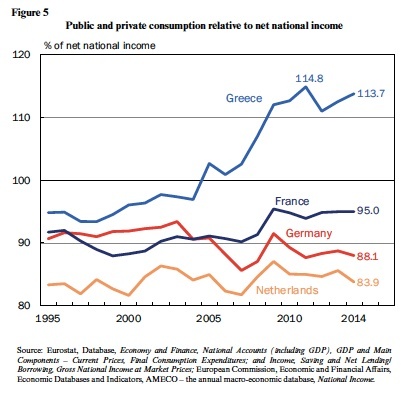 Figure 5 in the special issue, reproduced below, illustrates (private and public) consumption relative to net national income in Greece, France, Germany and the Netherlands. This entry was posted in Notes and tagged Capital flight, Competitiveness, Consumption, Current account, Devaluation, Dutch disease, ELA, EU, European Central Bank, Greece on June 22, 2015 by Dirk Niepelt.